Kent Sheely is playing through the original Call of Duty: Modern Warfare, only he’s doing it with one very strict rule: no killing. 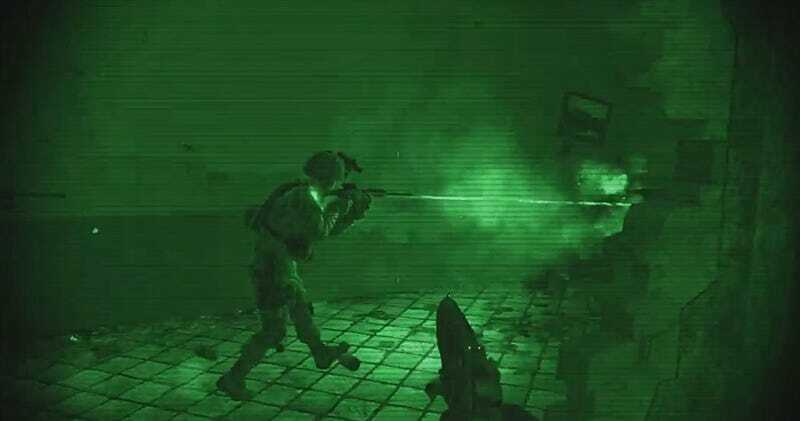 An attempt to play through Call of Duty: Modern Warfare without killing anyone. The rules are I’m only allowed to kill when the game will not let me proceed in any way without doing so (usually in a glorified cutscene, such as the kind that require me to shoot a vehicle before the story can proceed). Kirk dabbled in this last year during a driving sequence, and of course we all know that you don’t have to shoot the hinges, but those were isolated instances. This is playing through the entire game. It’s interesting/hilarious to see someone able to go so far through a game that’s only about killing without, well, doing the only thing the game was designed to do. Watch enough of this and it starts to feel like a whole new game. Kirk’s car ride was like a theme park ride, but an entire game is different. No longer are you some badass British or American soldier. You’re the world’s bravest/dumbest war reporter. He’s not done yet, but if you want to watch the whole playlist, you can catch it here.